I'll be adding more details soon-ish. Till then you'll have to check out the thread if you want to know more. The basic idea is that these are REALLY MINIMALIST meshes. Add a couple of levels of multires/SubD and they'll begin to look better. Add a texture using the included (very basic) bump, displacement and texture images and they're even better. They're intended for people who are modelling props that require knotted string, cord, or rope. Import them into your modelling program, and do what you like with them. The texture images were created from GIMP's 'burlap' pattern and 'Rounded Edge' blend. The main promo shows the basic mesh overlaid with a render of that exact mesh in Poser 6, with smoothing, textures, bump and displacement applied. Who says you need a high-res mesh? Trekkiegrrrl (8 months ago) Inappropriate? HOW have I not found these before? Thank you! Yeah!! Thank you so much for doing all this hard work!! 3D Fineries (6 years ago) Inappropriate? Awesome, 3DCHeapskate! I have to say these knots are pretty awesome! 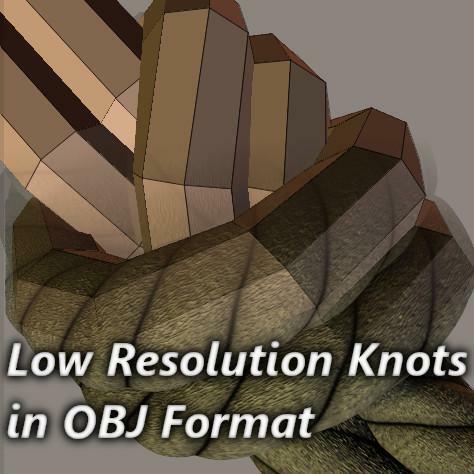 3D Fineries: If there's any problems ask them to PM me (the knots are in Renderosity Freestuff too).